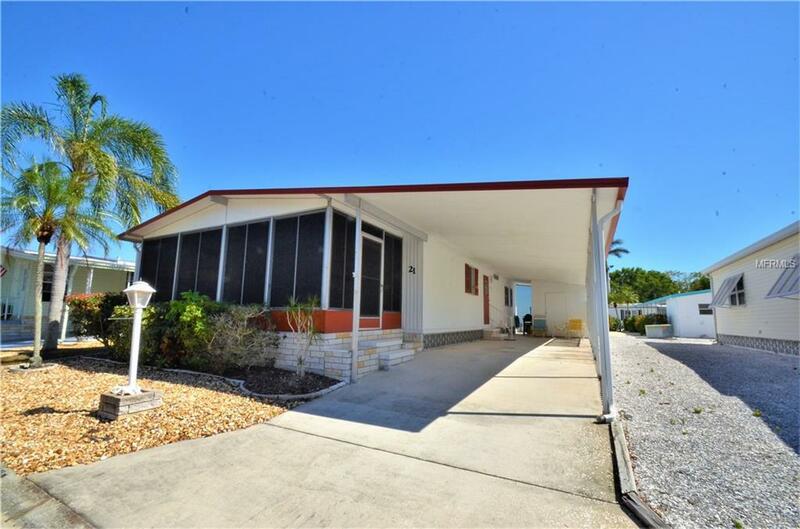 Beautiful FURNISHED 2 Bed and 2 Bath Double Wide Mobile Home in Palma Sola Shores just off Palma Sola Boulevard. Gorgeous Palma Sola Bay is a short walk from this home. FURNISHED...Very private setting with vinyl enclosed Lanai/Florida Room Must see the condition of this home to appreciate! Bedrooms have walk-in closets. Outside utility shed under carport (07x10) with washer/dryer and workbench. Updated kitchen with newer Appliances and a New AC System, Enjoy a Short walk to the Active Community clubhouse and pool. Palma Sola Shores gives you a peaceful feeling as you tour the neighborhood. Friendly smiles and waves will immediately make you feel at home a. Numerous social activities give you a chance to meet your new friends and neighbors. With their fun scheduled activities of Dinners ,Lunches, Card games, Shuffle board, Tennis, a Heated Community pool & Hot Tub and Community Trips, Palma Sola Shores is A great place to call home!